In 1767 Richard Reynolds created a set of rails for moving coal at Coalbrookdale; these were initially wood but became iron rails. In 1801 the first Act of Parliament was passed for the creation of a ‘railway’, although at this point it was a horse pulled carts on rails. Small, scattered railway development continued, but at the same time, the steam engine was evolving. In 1801 Trevithic invented a steam driven locomotive which ran on roads, and 1813 William Hedly built Puffing Billy for use in mines, followed a year later by George Stephenson’s engine. In 1821 Stephenson built the Stockton to Darlington railway using iron rails and steam power with the aim of breaking the local monopoly of the canal owners. The initial plan had been for horses to provide the energy, but Stephenson pushed for steam. The importance of this has been exaggerated, as it still remained as “fast” as a canal (i.e. slow). The first time a railway used a true steam locomotive running on rails was the Liverpool to Manchester railway in 1830. This is probably the true landmark in rail, and mirrored the route of the groundbreaking Bridgewater Canal. Indeed, the owner of the canal had opposed the railway to protect his investment. The Liverpool to Manchester railway provided the management blueprint for later development, creating a permanent staff and recognizing the potential of passenger travel. Indeed, until the 1850s railways made more from passengers than freight. 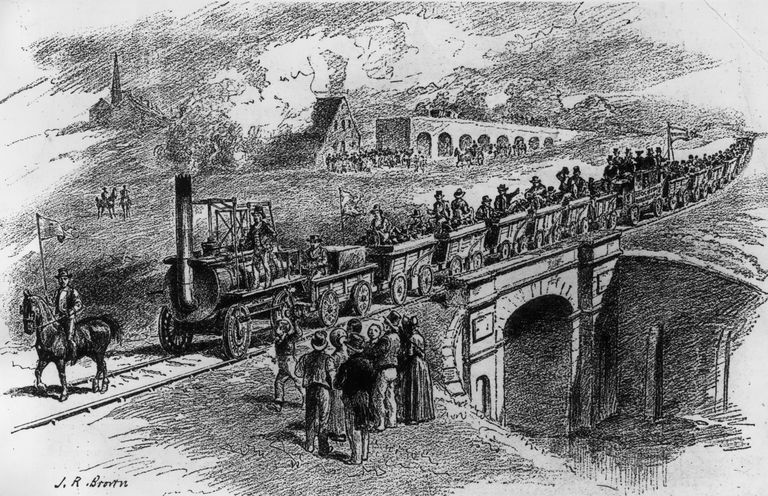 In the 1830s canal companies, challenged by new railways, cut prices and largely kept their business. As railways were rarely connected they were generally used for local freight and passengers. However, industrialists soon realized that railways could make a clear profit, and in 1835 – 37, and 1844 – 48 there was such a boom in the creation of railways that ‘railway mania’ was said to have swept the country. In this later period, there were 10,000 acts creating railways. Of course, this mania encouraged the creation of lines which were unviable and in competition with each other. The government largely adopted a laissez-faire attitude but did intervene to try and stop accidents and dangerous competition. They also passed a law in 1844 ordering third class travel to be on at least one train a day, and the Gauge Act of 1846 to make sure the trains ran on the same sort of rails. Railways had a major impact on farming, as perishable goods such as dairy products could now be moved long distances before they were inedible. The standard of living rose as a result. New companies formed to both run railways and take advantage of the possibilities, and a major new employer was created. At the height of the railway boom, massive amounts of Britain’s industrial output were funneled into the construction, boosting industry, and when the British boom subsided these materials were exported to build railways abroad. In order for trains to be timetabled, a standardized time was introduced across Britain, making it a more uniform place. Suburbs began to form as white collar workers moved out from the inner cities, and some working class districts were demolished for new rail buildings. Opportunities for travel broadened as the working class could now travel further and more freely, although some conservatives worried this would cause a revolt. Communications were vastly sped up, and regionalisation began to break down. The effect of railways in the Industrial Revolution is often exaggerated. They did not cause industrialization and had no impact on the changing locations of industries as they only developed after 1830 and were initially slow to catch on. What they did do was allow the revolution to continue, provide further stimulus, and help to transform the mobility and diets of the population.